Freshwater fishing is unique as there is an extremely wide range of baits available to the anglers. As well as the major choice of natural baits, there is also a selection of processed baits available to the angler. Processed baits can be very effective and many processed baits have a number of advantages over natural baits. Corn that is used whole can be highly effective such as when targeting for many bottom feeders. Corn can be used straight from the tin, all that needs to be done is to hook the corn onto a hook. Bread is a very common bait when freshwater fishing. The advantages of bait are - its cheap, effective and useful. As the bread slowly releases its flavour into the water and the currents spread crumbs to hungry fish. Bread can be used as bottom bait or as surface bait. An excellent ground bait is roasted bread crumbs that have been compressed together. It does not really matter what kind of bait is used it can be white, brown or whole wheat. Nuts can also be used as bait, the most common nuts used are peanuts. The nuts need to be soaked overnight or boiled before use. When fishing for carp, butter beans and tinned baked beans will be useful. Beans can be used as loose feed or be mixed with a suitable ground bait. Harder baits such as kidney beans will need to be soaked or boiled before use. Meat is a suitable bait when fishing. Trial and error might need to be used when fishing with meat as the type of meat will depend on the river/water and species. Common meats used are ox heart and chicken livers for eels and catfish, tinned meats such as bully beef and sausages will attract carp and Yellowfish. A simple and easy mixture of egg and flour based doughs can be highly effective when freshwater fishing. 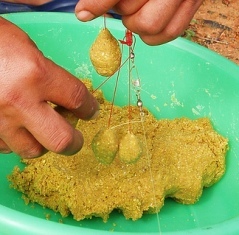 Mudfish, Kurper, Carp etc will readily take dough baits. Boil 125 ml (½ cup) of water and mix 750 ml (3 cups) of mealie meal with 325 ml (1 ½ cups) of flour. Slowly add the dry ingredients to the water. Stir the mixture for 5 minutes and then lower the heat. Leave the dough to cook for 10 minutes on the lower heat and then knead the dough and allow cooling time. The example to the left is made from animal feed. Cheese can be used as bait in a number of forms including hard, soft, paste form, chunks, and cubes. Cheese makes excellent bait for bigger fish especially carp. Due to the cost of cheese its uses are limited.